These are good times for comedy. Giving the most maverick wing of the MCU outside Guardians of the Galaxy – this one ripe for resurgence following a shaky sequel – to a reliably off-the-wall comedy genius managed to be both a brave and low-risk move from Marvel; fortunately, Taika Waititi doesn’t disappoint. When you take a step back, it’s clear that the Captain America franchise is what holds the MCU together. Not because of key plot points or character overlap, although those are important, but because it provides the beating heart of the whole: the moral compass and the conflicted human core. In Civil War, the Russos have built on a strong foundation to produce what is unquestionably one of the finer examples of a superhero ensemble movie that we’ve seen yet. One of the ways in which they do this is in not shying away from telling a story: thoroughly, engagingly – above all, emotionally. Joe Johnston set the scene: The First Avenger stretched the origin story out in a way that no other MCU film has – contrast this with Tony whose suit building is done in the first 35 minutes with such alacrity that it feels like a pre-credit sequence, the emotional arc flattened by the force of his impulsive personality. For Cap, almost half the story takes place before the (physical) hero has been created. The thrills deliver when they come, but their goal is to show the building of a man – the polar opposite of Stark, holding the attention with simple, quiet determination – not a machine. So the Russos ran with it once they had their turn at the helm: The Winter Soldier has the pace of a Cold War thriller, but is at heart an exploration of friendship and trust. In Civil War we’re treated to the evolution of that: a rich examination of the nature of family. In the aftermath of the events of Age of Ulton and following a catastrophic intervention in Nigeria, the question of quis custodiet ipsos custodes raises its head: should the Avengers be controlled by the United Nations and deployed by committee – political weapons, if you will? Horrified by the human cost of his Ultron experiment, Tony Stark believes so; Steve Rogers, battle-scarred Boy Scout, disagrees. When one James Buchanan “Bucky” Barnes resurfaces accused of a shocking atrocity, confrontation becomes inevitable and the rest of the team are forced to choose a side. The emotional heft here is undeniable, but punctured with outrageously fluid set pieces – including a Greengrass calibre car chase – and a solid sense of humour, it works beautifully. With the freedom to choose how much to involve anyone beyond the main protagonists, rather than the obligation to balance them, Civil War feels very much like the film Ultron could, perhaps should, have been – and Christopher Markus and Stephen McFeely’s script has at least a handful of Whedonesque moments to prove it. Still, the focus is remarkably broad; alongside the ideological battles between Steve (an eternally straight-faced Evans bringing his usual quiet likeability) and Tony (the best we’ve seen from RDJ in the role yet), is generous screen time for Black Panther in advance of his upcoming solo outing. Despite their shared litheness, steely Chadwick Boseman contrasts beautifully against a high-energy first appearance from Tom Holland that should make us all thoroughly excited for the upcoming Sony Spider-Man reboot. A pleasantly quirky fan-pleasing chemistry is explored between Vision and Scarlett Witch, though both feel a fraction underused, and if we’re not entirely sold on Natasha Romanov’s new-found maternal instincts, her long-honed propensity to play both sides renders her the most intriguingly unpredictable “enhanced individual” in the line-up. Though the seeds of the conflict are sewn long before his appearance on the scene to stir up trouble, the endlessly watchable Daniel Bruhl isn’t wasted as Zemo either, in a carefully judged and admirably restrained villainous turn. Finally, somehow, there’s enough latitude given to make the appearances of Ant-Man, Hawkeye and War Machine worthwhile while still at least attempting to make clear that this is not an Avengers movie (honest guv). We engage when Stark and Rogers square up against each other because we care about them – and in the choices that those around them make (Hawkeye and Black Widow hurling punches while discussing whether they’re still friends is both absurdly funny and poignant). With yet another Bruce Wayne to familiarise ourselves with and a Clark Kent who barely considers changing his world view, Batman v Superman, leached of all tension, never stood a chance by comparison. Admittedly, Civil War might have benefited from a tighter approach to the action sequences – there’s a danger some of the more dramatic clashes are undermined by the volume and length of the fight scenes. But it seems a worthwhile trade-off to allow the Russos a little bit of indulgence in the fireworks since they’re willing to invest the same effort in the more discursive scenes. If Iron Man deals in flashy theatrics, Thor brings the Shakespearean space opera and Guardians of the Galaxy is an adult’s adventure story, Civil War places Cap firmly at the emotional centre, dragging everyone in its orbit in to examine their own place in the MCU – but crucially with wit and warmth rather than an excess of ponderous brooding. With more of Ant-Man‘s humour and Doctor Strange’s mysticism on the way to keep it balanced, there’s no sign of this juggernaut losing momentum. And thank goodness for that. 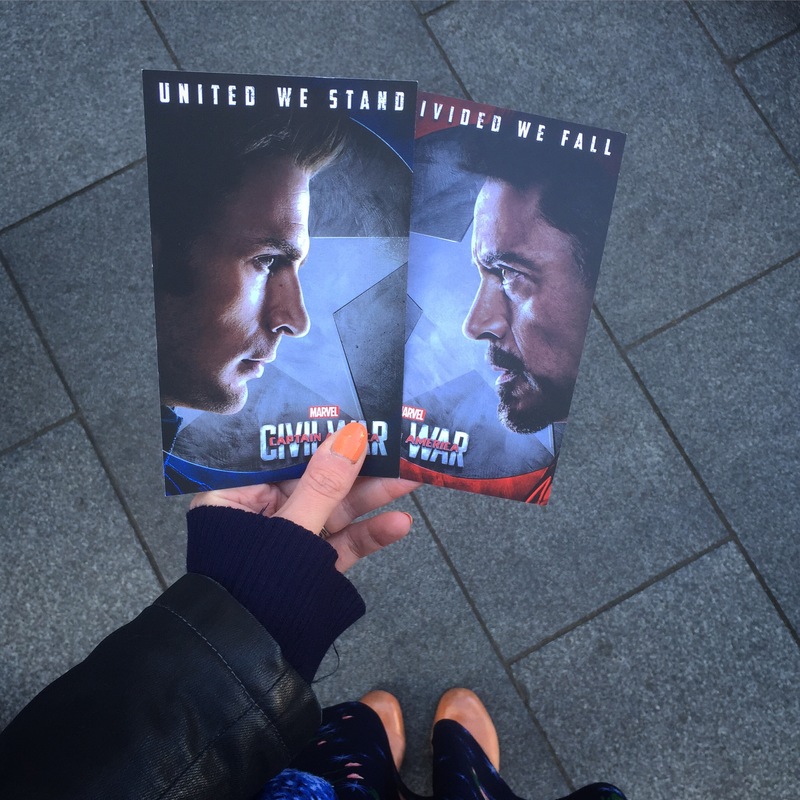 Captain America: Civil War is released in the UK cinemas on the 29th April. Disclosure: Press tickets were provided by the Disney UK team. Opinions are my own. Neither of these moments appears in the Harry Potter books but they are now, technically, film canon. (Alright, the first one does, but it’s specifically described as Dumbledore delivering the line “calmly“). How Harry can be almost expelled for flouting the Decree for the Reasonable Restriction of Underage Sorcery while trying to prevent a disaster one summer and then, with nary a slap on the wrist, cause temporary retinal damage for no reason the next, who knows? But there it is, for anyone to Google. The thing is, they make for good movie moments. As much as I have many conflicted feels about the way Michael Gambon interpreted a Dumbledore he never read, and the way David Yates directed him in that, the fact remains it was an interpretation. I was free to watch it or not watch it. Like it or not like it. There are three universes at play here: the books, the films and the one in my head. It is neither realistic nor desirable for those to all be identical (if nothing else, book and film are very different media; as sorry as I was to lose Hermione’s impassioned S.P.E.W. campaigning, I concede it would have made pretty dull viewing). Now, enter a new galaxy. Along comes a play, based on an idea none of us have yet read, with the original author’s involvement, in which some characters make the leap (though only in a form vaguely similar to how we last saw them, briefly, in a train station, and not at all how we spent the most time with them). In this completely fresh creative effort, which – not actually being the next book or film in either existing series – has pretty much full freedom to stand alone, one character is a different race from her mainstream portrayals thus far (ie book covers and film casting). And in a virtuoso display of how quickly the commenters of the internet can race to the bottom, every single individual who cannot cope with their white-centric world view being nudged even a tiny bit turns to the text to prove that it’s not ‘canon’. I am not going to argue the point over Hermione. How I feel is pretty much summed up in this one tweet; I also couldn’t face battling the hordes for tickets, so it’s going to be a long time before I get to see The Cursed Child (sob!) and whoever is in it by then I shall be very excited about it. But this canon malarkey has got to stop. This obsession with picking over the details – as if authors can’t be fallible! As if there are not inconsistencies within universes! As if art can’t just bloody change if we want it to! – is taking the very joy out of being an enormous nerd. Look, I get the geekery, of course I do. Two nights ago, on the way home from town to see the Christmas lights, my husband got my full spiel – not for the first time, frankly – on the individual nature of each individual and group strand of the MCU so far, and why Captain America: The First Avenger gets away with being the world’s longest origin story while Iron Man dispenses with the practical bit in the first ten minutes. He got the Shakespearean Thor spiel, and my speculations about how the use of Spider-Man might be the bit that prevents Civil War coming across as an Avengers movie. The thing is this: it is enormously enjoyable to deconstruct and reconstruct, to Google original comic book references, to spot Easter eggs, to come up with elaborate theories and to be, frankly, a bit paranoid – the interlocking successes of the MCU surely rest in part on this irresistible urge to neatly link things together. But it is also nonsense. Because between the myriad comic book strands, the visions of Kevin Feige and Marvel Studios, the scriptwriters, the directors, the editors, the cinematographers and the interpretations by the talent (plus the audiences themselves) there can be no such real thing as canon. It’s simply impossible. There are too many people involved. Messy, messy people. It is, of course, disappointing when something you see does not satisfactorily chime with the contents of your head – or when your favourite paper moment doesn’t make it to the screen. But it is not necessarily wrong. There are times, I think, when one can be critical – for example, I think Yates made a downright peculiar choice to have Bellatrix and Voldemort dissolve rather than be real dead bodies, as I thought the whole point of those battle scenes in the book was to show the brutal, damaged, evil but very real humanity of the man who was once Tom Riddle. But that was less to do with having it be exactly as I pictured it, and more to do with making that point as I had understood it; I didn’t want any hint that the pieces of Voldemort could be swept back into a pile and reanimated (as if Otto Chriek and his emergency blood had just teleported over from the Discworld). Or any re-affirmation of his belief in his own exceptionalism. And yet I understood that it made for a much more cinematic moment, and had to concede that even when we’re both staring the same source material right in the face, Yates and I might yet be reading it differently. Let me get things straight: of course I’m not saying that everyone should like every interpretation, neither that it’s necessarily wrong to argue it (it can be fun). But I think you do have to ask yourself why it’s bothering you and if your objection doesn’t come from the text, but an unexamined prejudice. And even when it does come from the text – does it really matter? When people argued that Jack Reacher, continually described in the books as being a huge dude, could not be embodied in not-quite-so-massive Tom Cruise, I did have a moment’s pause. But actually, it made little or no impact on the final result (in fact, it actually heightened the tension in scenes where gangs of rent-a-muscle thugs sneer at Reacher’s cast-iron self-confidence). When it comes down to it, canon, despite being apparently pegged to the page or screen, none the less still lives entirely in the eye of the beholder – and the beholders of Hermione live in a world where whiteness is regularly the default. Our lenses are scuffed and blurred, and it sometimes takes someone making an unexpected choice to unfog them a little. Canon is a security blanket; reassuring, familiar, warm and comfortable – but if you look at it a little closer, frayed, full of holes and overdue for a wash. Sometimes adding a little embroidery or a patch can change it into something newer and more beautiful. And even if you run in desperation to Mama, you might not get the answer you want to hear.